April has been one of those amazingly crazy months where it seemed that every event was happening all at once. It was a really fun last 29 days.. But I'm so thankful that it's almost over! Here's a peek into my instagram diary for April. The first of 12 (yes count them, TWELVE) April work events started off with a bang. And a delicious cold Hell or High Watermelon brew. A few days before Gisele's retirement, I decided to take my next career move 😂. Just kidding. But I did have fun walking in Parlor Dry Bar's spring fashion show for The Impeccable Pig. I just had to have this amazing multi-color cork clutch that I found at Moon & Lola's new Cameron Village store. Isn't the gold tassel just the icing on the cake? We had our Southern Blog Society NC Meet Up this month at the Kendra Scott Southpoint store in Durham. More on that to come! Aren't these Kendra Scott earrings from the new Via Maya collection just fantastic? Sometimes we just need a Monday reminder to keep the Good Vibes coming. Thanks Happy + Hale. Had an absolute blast hosting The Impeccable Pig's birthday party! Here's a sneak peek of my outfit. With spring time officially here and summer right around the corner, you know what that means... 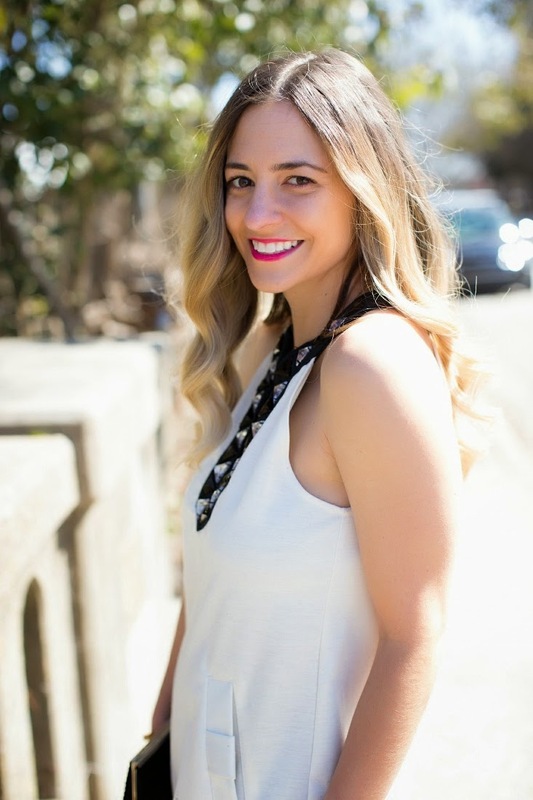 It's time for dresses from The Impeccable Pig! I seriously don't know what I would do without this store. They have the cutest stuff. I know that no matter what event I'm planning to go to, I can always find something I need (and want!) there. I wore this dress for a fashion show last week and just had to have it so I bought it right off... well myself! 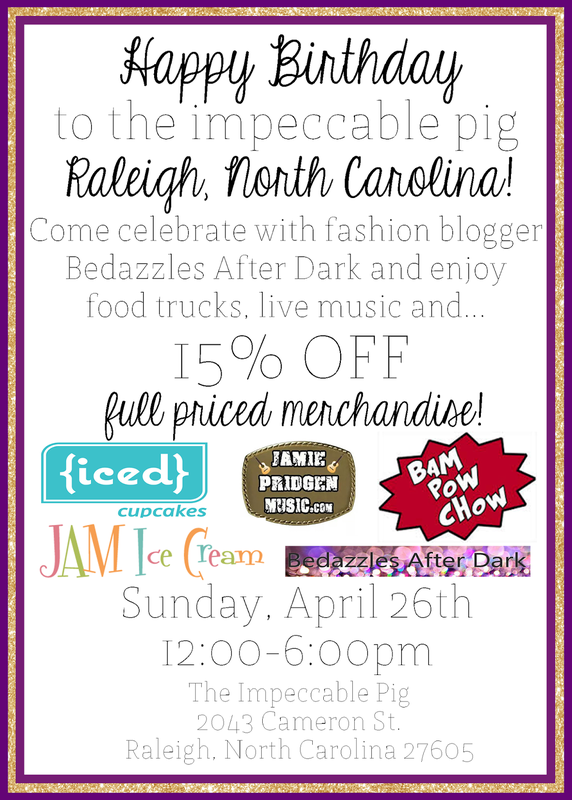 Oh and for your Raleigh ladies I have an exciting event to tell you about! Before we get to the dress, can I just say how fabulous my new bag is? 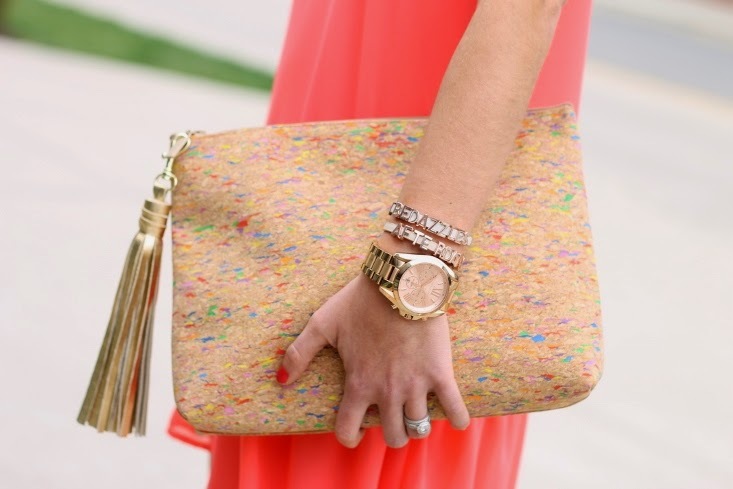 I'm predicting that cork is going to be a hot must-have trend for summer. 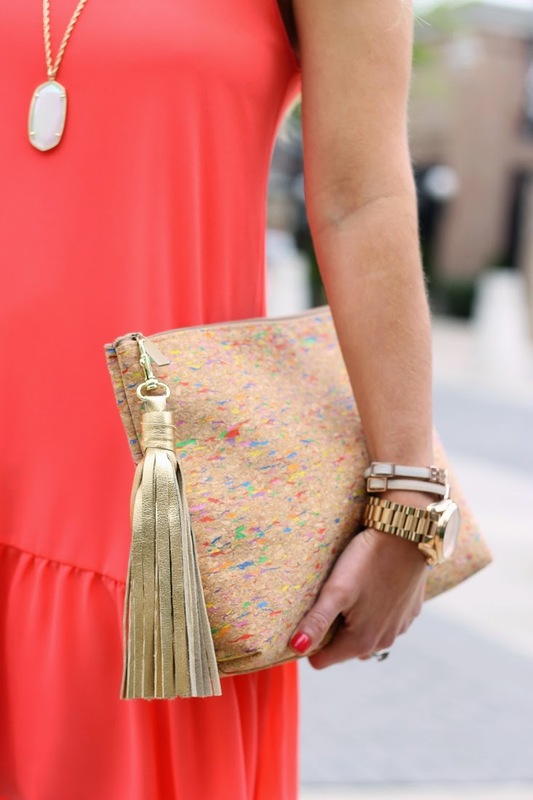 And the gold metallic tassel... don't even get me started! I LOVE everything about this dress. The drop waist. The sweet ruffle trim. The color. I mean you know how much I love bold, bright and neon pieces. Can you say obsessed? But if that isn't exactly your favorite, this gorgeous coral color is a happy medium. I just talked with the Raleigh store manager and she said they recently got the same style, in a pretty royal blue! Speaking of the Raleigh store.... The Impeccable Pig's Cameron Village location is having it's 2nd birthday! They wanted the throw a big bash to celebrate and asked me to host. 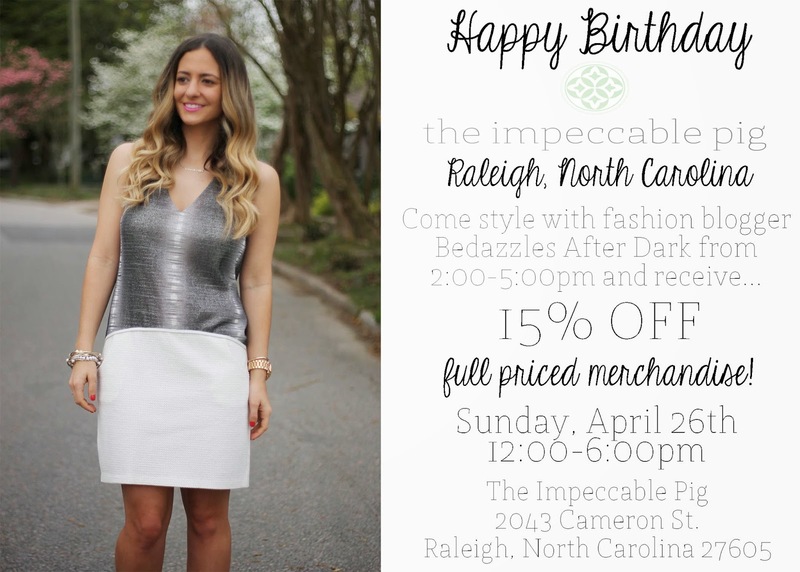 I'll be there this Sunday from 2 pm - 5 pm, helping you pick out some awesome spring looks. You can shop full priced items at 15% off, listen to some fab music, eat food from at least 3 different food trucks and more! I really hope to see you there!! 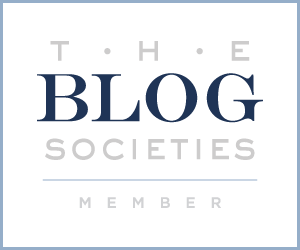 Last week was a c-r-a-z-y week filled with lots of events. Friday night I had 2 parties to attend and this jumpsuit was just the right amount of comfortable chic that I needed. Shout out to Jamie over at Furbish Studios. The new space looks incredible and I'm so happy I got to see it! Can we talk about the incredible Kendra Scott ear cuffs I picked up at my Southern Blog Society event? They're gorgeous with a capital GORG. If you haven't checked out their new Via Maya collection, go see it immediately. Right here. Don't wait! Let's just call me #RomperObsessed! I had a major love affair with rompers last year and have zero intentions of falling out of love with them (i.e. see yesterday's post) I bought this one as a New Year's Eve holiday option this past winter, but the nice thing about sequins? In my book, they're always a good idea! Maybelline Vivids Lipstick in "Hot Plum"
There's not much to this outfit - mostly because the gold sequins speak for themselves! A few black accessories and my favorite Name Plate necklace were all I needed. That's the thing about rompers - they're a one stop shop. Makes getting dressed so easy! I found some awesome sequin rompers for you to shop too! Talk about a pretty party look!